12 pp. Roman, 340 pp. Tamasheq is the language spoken by the Tamasheq people, descendants of Berber traders and warriors who traversed the Sahara and settled along the routes and the lands beyond, and the black African peoples enslaved by these raiding warriors. The language therefore closely resembles the Berber languages of the Maghreb instead of the neighbouring sub-Saharan African languages. It is estimated that there are between one and two million speakers of Tamasheq, found mainly in Algeria, Mali, Niger and Burkina Faso but spreading into Libya, Mauritania and Morocco. Among the Berber languages Tamasheq represents presumably the language still the least influenced by contact with Arabic or other languages, although most of the Tamasheq people today are at least bilingual. This second edition of The Tamasheq of North-East Burkina Faso is based on data gathered between February 1994 and February 2007 in Oudalan province, Burkina Faso, where the vast majority of Burkinabé Tamasheqs are found. The author was resident in Gorom-Gorom for the first two years and later in Markoye. He also visited camps and villages throughout the Tamasheq speaking areas, notably Beyga, Darkoye, Zigeberi and Tin-Akof. The two dialects of Tamasheq spoken in Burkina are covered in the main sections of the Grammar while com­parisons with the dialects of Mali and Niger are made in the first appendix. The grammar fills a gap in the current literature in two key ways. Firstly it describes in detail the Tamasheq dialects of Burkina which have not previously been studied. Secondly it describes all aspects of the grammar in a relatively non-technical style with a view to pedagogical usefulness. The grammar comprises five main sections: Firstly an introduction which gives background information on the history and language of the Tamasheq in general. Secondly a set of introductory texts that give a selection of key phrases in the language. The third section gives a comprehensive overview of the grammar of the language complete with detailed examples. The fourth section deals with the complex verb system, providing a simplified structure and listings of verbs according to their type. Section five is a key vocabulary listing important words by theme and includes chapters on idiomatic phrases and proverbs. 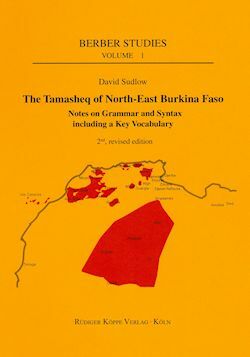 The first appendix provides an overview of the differences between the Burkina dialects and other Sahelian dialects of Tamasheq, while the second appendix is a short bibliography. A Tamasheq-English dictionary and a text collection is also available with us, see the links below. The new Rüdiger Köppe series Berber Studies starts with a remarkable volume. David Sudlow, a member of the Summer Institute of Linguistics, presents us with a grammatical sketch with dialogues and vocabulary of the southernmost Berber varieties, the Tuareg of Burkina Faso. This is the first linguistic work on these dialects. [...] David Sudlow's book constitutes an important contribution to Tuareg dialectology and to Berberology in general. Grammatical description may not always be very profound, but is illuminated by well-chosen examples. Tuareg forms are remarkably well transcribed, and every page attests to Sudlow's intimate knowledge of the language. We must be grateful to the author that due to his work we are now so much better informed on these fascinating dialects.